Power is supplied to the navigation receiver assembly and steering pad switch assembly illumination when the light control switch is in the tail or head position. The vehicle is equipped with a Supplemental Restraint System (SRS) which includes components such as airbags. Before servicing (including removal or installation of parts), be sure to read the precaution for Supplemental Restraint System (See page ). (a) Check if the illumination for the navigation receiver assembly, steering pad switch assembly, heater control switch or others (hazard switch, transmission control switch, etc.) comes on when the light control switch is turned to the head or tail position. Illumination comes on for all components except steering pad switch assembly. Illumination comes on for all components except navigation receiver assembly. Illumination comes on only for steering pad switch assembly. No illumination comes on (navigation receiver assembly, hazard switch, heater control switch, etc.). (a) Disconnect the D18 spiral cable with sensor sub-assembly connector. (a) Remove the steering pad switch assembly (See page ). (b) Connect a battery positive (+) lead to terminal 5 (IL+2) and a negative (-) lead to terminal 3 (-DP) of the steering pad switch assembly connector. 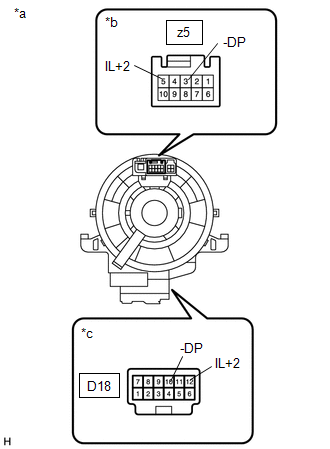 (c) Check if the illumination for the steering pad switch assembly comes on. Illumination for the steering pad switch assembly comes on. (a) Remove the spiral cable with sensor sub-assembly (See page ). (c) After setting the spiral cable with sensor sub-assembly to the center position, rotate the spiral cable with sensor sub-assembly 2.5 times clockwise. 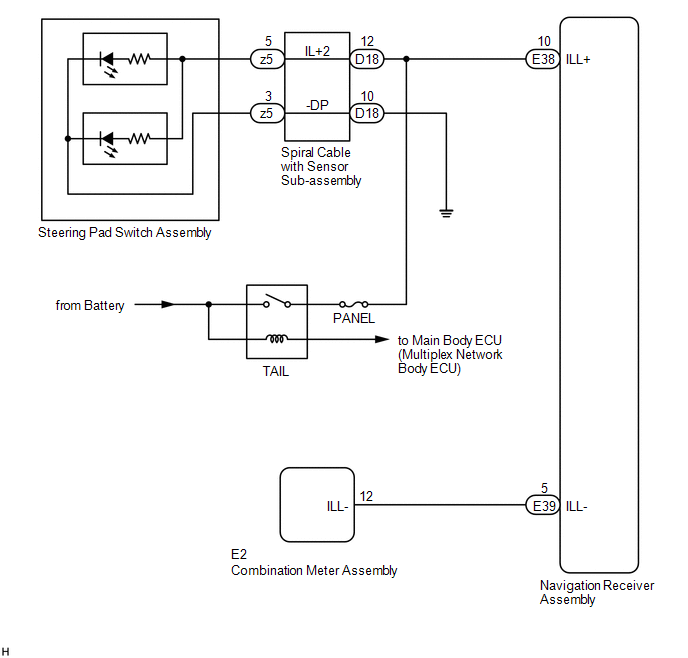 Then while rotating the spiral cable with sensor sub-assembly 5 times counterclockwise, measure the resistance according to the value(s) in the table below. Press and hold the lock located in the center of the spiral cable with sensor sub-assembly to rotate the spiral cable with sensor sub-assembly. 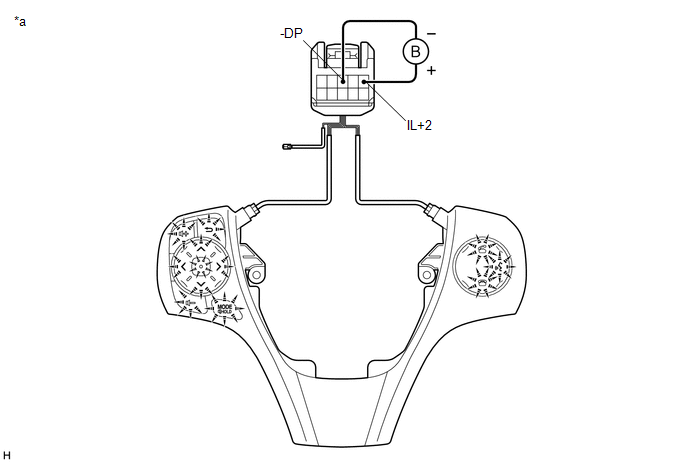 The spiral cable with sensor sub-assembly is an important part of the SRS airbag system. Incorrect removal or installation of the spiral cable with sensor sub-assembly may prevent the airbag from deploying. As the spiral cable with sensor sub-assembly may break, do not rotate the spiral cable with sensor sub-assembly more than the specified amount. (a) Disconnect the E38 navigation receiver assembly connector. (b) Disconnect the E2 combination meter assembly connector.